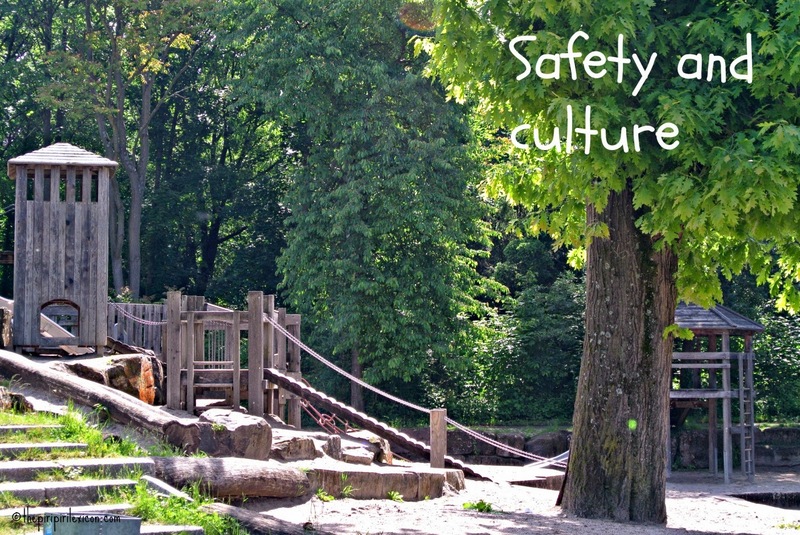 One thing living in different countries has taught me is that safety is not only personal but also clearly cultural. As soon as we moved to Germany, we discovered that, as opposed to the UK, Germany is clearly not as health and safety crazy. And, for me, this is a good thing. - Sand pits are everywhere and kids play bare feet in them when the weather allows it. Cat and dog litter trays? - Water-based playgrounds where kids run around naked or in underwear. Perverts dreamland? - Open gates between the school playground and the nearby public playground are common. Kids potentially walking off during recess? - Rough wooden structures full of sharp angles have not been taken over by plastic. Splinters? - Marble tracks, hammer and nails in kindergartens are well known activities. Choking or hitting dangers? In a discussion with other expat mums, I discovered that some young mums were horrified at some of these dangers and even refused their child's access to some of these activities/facilities because of the potential accidents. When my daughter was 18 months old she started attending a little playgroup with about 10 kids and 2 adults supervising twice a week for a few hours. 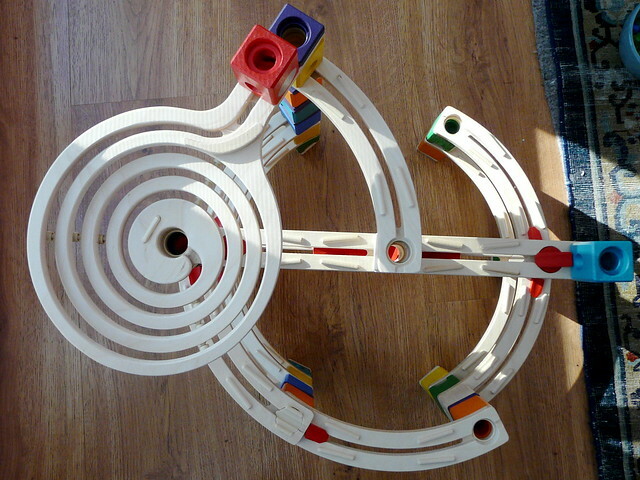 The said playgroup had a marble track and a little basket of normal-sized marbles. I never batted an eyelid about it until other expat mums refused to put their kids in the said playgroup because of the marbles. The playgroup has actually very few expat kids. About 90% of the children there are German. And I assume no German parent ever complained or raised an eyebrow about it as the playgroup is run by parents. Aren't marble tracks awesome? Pic by B. Sawyer via Flickr. And I suddenly realised that, even if we all have different parenting styles (even within one culture), safety and danger is really engrained in a culture. Just like this mum's reaction to the Dutch parenting style. In Switzerland and Germany, it is common to let young children have a knife (think Swiss army knife) to play outdoors, forage, cut leaves and branches etc. In Germany, there are kindergartens where 3-6 year olds spend the whole day everyday outdoors. Come rain, hail, snow, they spend their time in the forest. This is actually called a forest kindergarten. I think both these examples are pretty unthinkable in a lot of nearby nations. When we registered for our current place at kindergarten, we had to specify whether we would let our child go home alone. Now, she was barely 3 at the time, so there was no question about the answer! But the oldest kids there are 6. Do you know a lot of cities (we do not live in a village) where schools would let their 6 year olds make their way home alone? That shocked me more than letting small kids play with a marble track or hammering nails because I assume there is some kind of supervision for the other activities, just like there is at playgrounds. 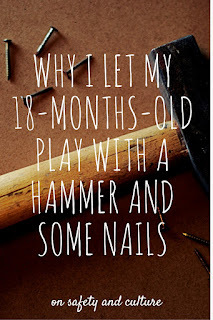 Just yesterday again, my son (barely 18-months-old) spent an hour on his first day at daycare (kindergarten) and kids were playing with tiny nails and a hammer by themselves. My son picked up the nails and nobody batted an eyelid. An adult later told one of the older kids to not leave the game unattended because the little ones could grab them and lose them! That was it. My son didn't put them in his mouth (I was watching) but just returned them to the box. I think that if I had reacted by frantically running to him and saying no, he might have actually tried to put them in his mouth. German kids do not die more than other kids because they choke on marbles or fall off high structures in playgrounds. Different cultures see aspects of safety differently and we, maybe, parent our children differently as a consequence. 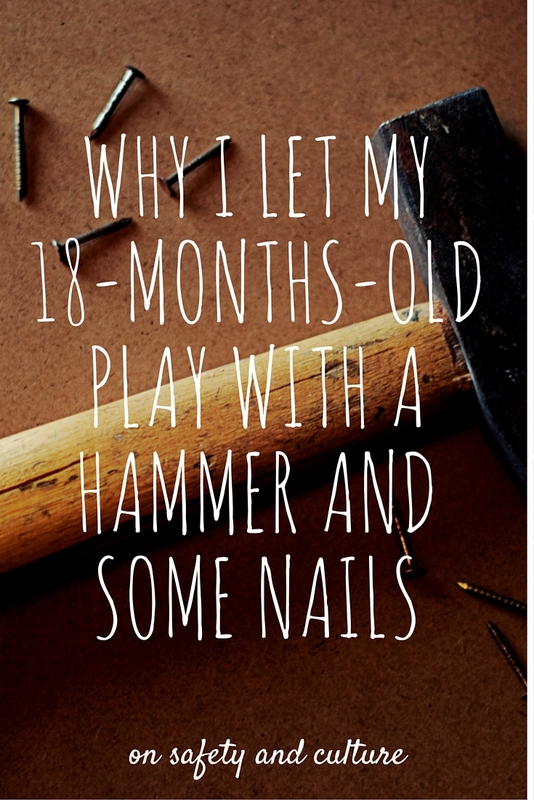 For me, personally, letting my child hammer little nails on a game or play with marbles and help herself to food with a real plate and cut her meat with a real knife at 3 years old (or even younger) means she will learn to be more careful earlier on. "As in most cultural matters, there is no right or wrong way of doing things. There are just different ways." S.G. I finally understand what "the piri-piri lexicon" mean. It is interesting and...different. 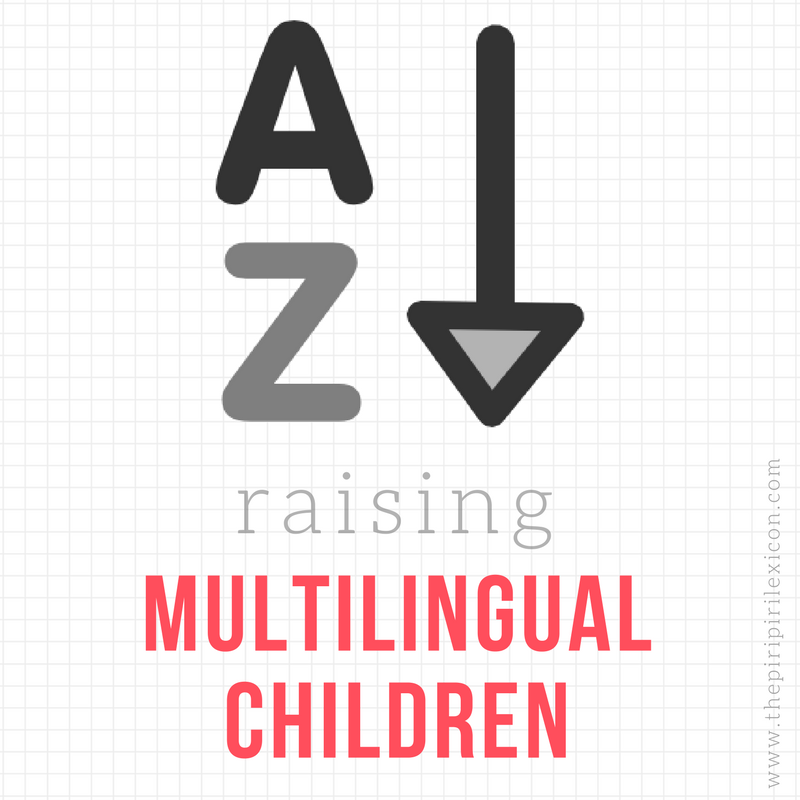 I am amazed to find out you are actually an expert in children education, especially in foreign language and linguistics. You should call your blog "an expert blog". Anyway, I added your site to my "link" page (http://www.best4future.com/blog/links) so that I can find a way back. Keep in touch! Thanks for posting this. I think it's more about how you grew up that determins how you parent your children. I am German, but my son (10.5 years old now) got a Swiss Army knife this year (his dad is Swiss...) but has a huge respect for it (as it is incredibly sharp). I grew up in Italy and noticed, reading your post and the responses you got on fb, that I'm probably more Italian than German about this. I love the outdoor Kindergarten though and would probably have sent my kids there if I would have had the chance. - You make a great point there and I would love to know more about safety on playgrounds and in Kindergardens (Preschool in general). At a local fair the other day- we heard an Italian family shout: oh my God they are letting the kids use knives to sharpen wood. The kids were supervised and the activitynwas all about creating wooden objects. No German batted a eyelid. But the Italian family was horrified. The kids were around 8-10 years old. I love those marble track things. I want a child so I have an excuse to buy one and play with it!! My brother is 7 and my dad still takes him to school (in the UK) and picks him up every day, mostly because there's a fairly busy road to cross to get to the school.